What a great day we're having! It's not really the what, but the how, you know? It didn't start out so great, but because of that fact, probably, things definitely went up shortly thereafter. Trev and I had a row about something, I can't even remember what, but after we worked it out, he was still feeling sad, so I asked if he'd like to go snuggle on the couch for a while. We ended up sitting there snuggling and reading for over an hour. 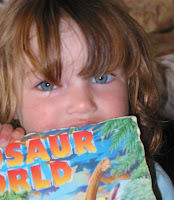 We read like a hundred pages in his dinosaur book. (I love, love, love these books - i've done a search for them, and evidently they're unavailable inthe US- they have real-life stories about a herd or a single prehistoric creature- the tales are very interesting and realistic. Wonderful. I got them at Walmart a few years ago, before my boycott. After that we headed downstairs for some imaginitive play. Started out with sand and dinosaurs, then we played Kitchen Garfield (?) 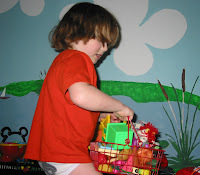 and John, (Maddie was Otie) and we went to the market to do some shopping (and paid for our goods, of course), then while we were out we stopped off at the Kitty Toy Store, then Toys r Us, and picked up a few things. I (Garfield) was very worried about the icecream melting in the car, but John assured me that all would be well. Then back home it was for some grocery putting-away, and John made me a delicious lunch of lasagna! 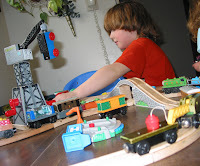 Later we came upstairs, and put out the Thomas set on the kitchen table. The babes had a fine time with that for a couple of hours. 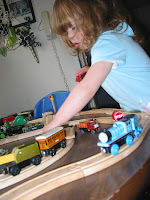 Maddie is learning already to take apart and put together the track, something Trev still isn't that interested in. Course, that particular evolving skill of hers was most vexing to her brother! Now the baby is taking her nap (a later one than I would choose, but, ah well. ), I'm here, and Trev is a few feet away watching the telly, waiting for me to get done so he can play on the computer. He has turned off the television like three times in the last half hour to ask " is your time up yet?" I am really quite surprised at this action, but I'll leave the personal observations for Happy and Free. Now Trev (still having the telly off!) has given me a time limit, (it's only fair) and my time is almost up. So I'm off to mosey around the kitchen for a while to see what offers itself up for our evening fare. Here's to hoping something speaks up!